Tokyo Governor Yuriko Koike, head of Japan's Party of Hope, attends a news conference to unveil its election campaign pledges in Tokyo, Japan October 6, 2017. TOKYO - A new party led by Tokyo Governor Yuriko Koike has unveiled policies it dubs “Yurinomics” that aim to revitalize the economy and cut reliance on fiscal spending and monetary easing, seeking to distance itself from premier Shinzo Abe’s more aggressive stimulus measures. The party, which is challenging Abe’s ruling coalition, also sought to set itself apart from Abe’s policies by vowing to freeze a scheduled sales tax hike in 2019. It is also seeking to end nuclear power by 2030 amid public safety worries after the 2011 Fukushima nuclear disaster. “We’ll carry out ‘Yurinomics’ that brings out private sector vitality, without relying excessively on monetary easing and fiscal spending,” the party said on Friday at a policy launch ahead of a national election on Oct. 22. “While maintaining the Bank of Japan’s massive monetary easing for the time being, the government and the BOJ should work together to seek a smooth exit strategy,” it added. The call to debate a strategy for ending ultra-easy monetary policy contrasts with the approach of central bank governor Haruhiko Kuroda - appointed by Abe - to hold off discussing a withdrawal of his massive stimulus program any time soon. Abe announced the snap election last week in the hope his Liberal Democratic Party-led coalition would keep its majority in parliament’s lower house, where it held a two-thirds “super majority” before the chamber was dissolved. But Koike’s new party - launched last week as a “reformist, conservative” alternative to Abe’s equally conservative LDP - has clouded the outlook amid signs voters are disillusioned with Abe after nearly five years in power. The party says “Yurinomics” - derived from Koike’s first name - will focus on deregulation to create jobs, increase capital expenditure and revitalize the stock market. It provided few details. The party will also consider taxing big firms’ massive internal reserves - worth around 300 trillion yen ($2.66 trillion) - to fill a revenue shortfall and encourage them to put unused cash to better use. Abe’s ruling coalition has pledged to proceed with the sales tax hike and use the revenues for child care and education. The premier also hopes to convince voters that aggressive monetary easing, fiscal spending and structural reform - dubbed “Abenomics” - have reflated the economy. Koike said her party will build on Abenomics and ensure more households feel the benefits of the economic recovery. “To make the economic recovery real, however, we need to carry out a more meticulous economic policy and social reform that would strike people’s heart,” she told a news conference. The new party has revealed little about how it plans to fix Japan’s finances, saying only that it was important to balance the state budget through spending cuts and revenues from selling state assets. And as with Abe’s LDP, it has yet to set a deadline for when Japan should achieve a balanced budget. In the news conference, Koike repeated that she won’t run for a seat in the lower house in the Oct. 22 election. Koike, 65, a former defense minister and member of Abe’s LDP, has not made clear whom her party would back as prime minister after the election. She defied the LDP to run for governor last year, defeating the ruling party candidate by a landslide and then leading her small local party to a huge victory on a reformist platform in a July Tokyo assembly election this year. 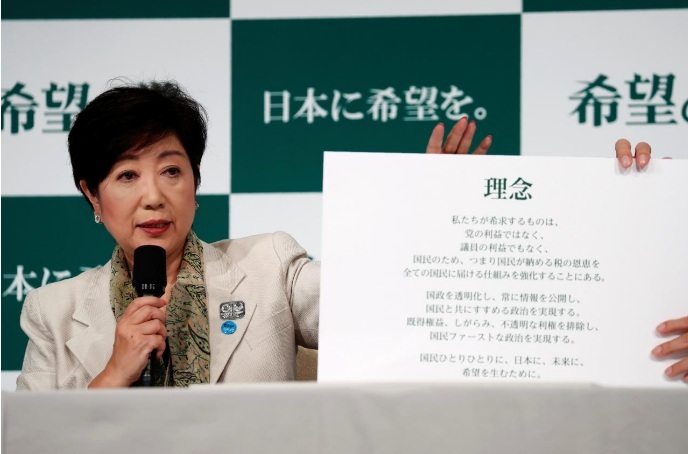 A new party led by Tokyo Governor Yuriko Koike has unveiled policies it dubs “Yurinomics” that aim to revitalize the economy and cut reliance on fiscal spending and monetary easing, seeking to distance itself from premier Shinzo Abe’s more aggressive stimulus measures.